How to get there: Drive Hwy. E-6 to Dombås, the take Hwy. E-136 north-west in the direction of Åndalsnes. 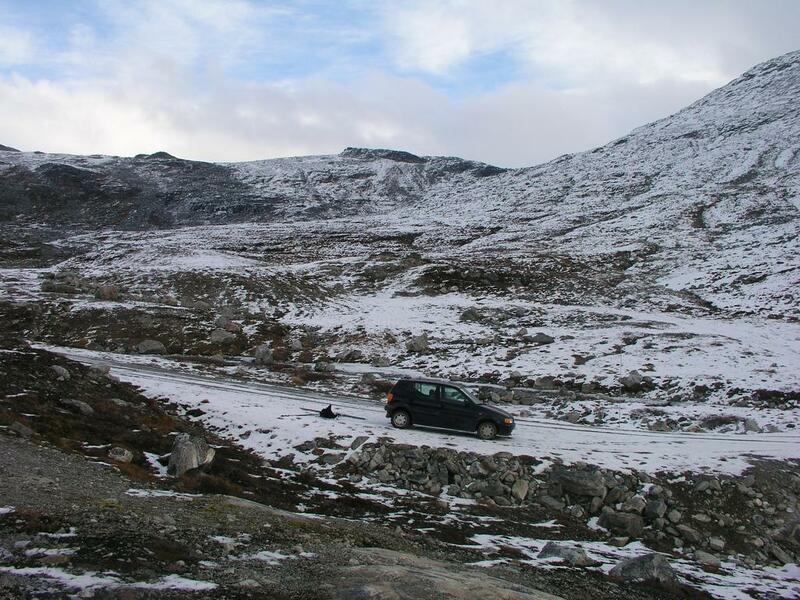 Drive about 60 km to the small resort called Bjorli. Bjorli has a gas station, a hotel, a restaurant and a grocery store (I made use of all four). Measure from the gas (Hydro-Texaco) station and continue 4.6 km further north-west. Turn right at the sign saying "Brude 3.2", and follow a smaller road that continues more or less parallel to the main highway for 1.8 km. At this point the road forks, take the right (uphill) fork. There is a sign saying that this road is an "Anleggsvei" (construction road), proceed at your own risk. No need to worry, the road is a very well maintained dirt road. It is likely closed in winter. Proceed along this road for an additional 9.5 km, first uphill, the road crosses the local water divide and actually is flat or heads slightly downhill the last few kilometers. The trailhead is close to a small bridge, there is parking off the road on the right just before this bridge or on a turnout on the left side just after the bridge. I parked at the turnout, coordinates are N62:21.935, E008:07.555, elevation 1154 meter. Route description: Head straight east from the trailhead. You will notice a valley (with a creek) coming down from the right behind Kaldhøa (1640m). Ascend this valley, stay on the right side of the creek. As you gain more level terrain, cross the creek and head more or less directly in the direction of the saddle between Kaldbottinden (1854m) and Børa (1916m). The route crosses a flat area north of lake 1395. 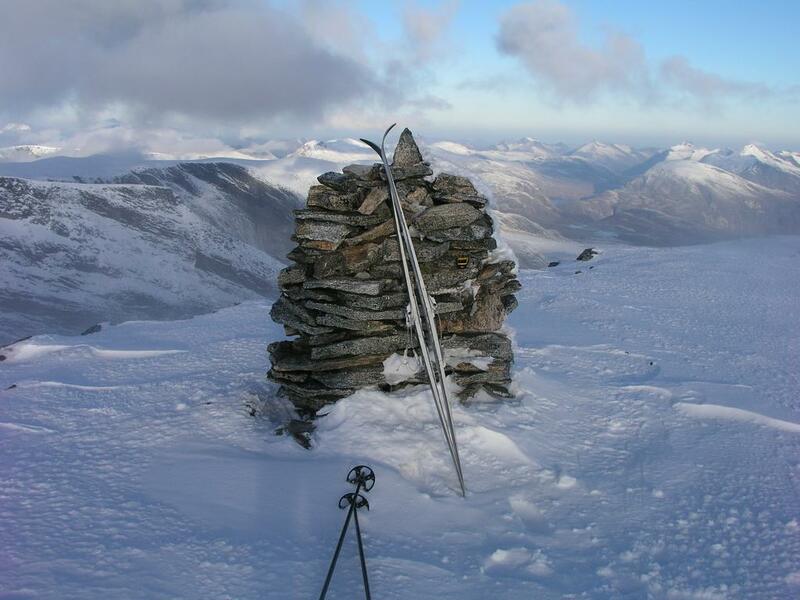 The slope ahead has several small cliffs, in summer and skiing with very little snow, the easier route seems to be a bit south of the saddle, that is on the very lower north-west slope of Kaldbottinden. Higher up, the terrain becomes much easier, contine on an ascending traverse to the saddle between Børa and Kleneggen. This saddle has GPS coordinates N62:22.950, E008:11.464 and elevation near 1830 meter. From this saddle, contour up to point 1933, the easier slope is to stay well left of the ridge and cliffs that connects directly from the saddle. From point 1933 to the summit is an elegant high ridge that dips to about 1910 meter in the middle. Beware of the steep cliffs on the south-east (right) side. 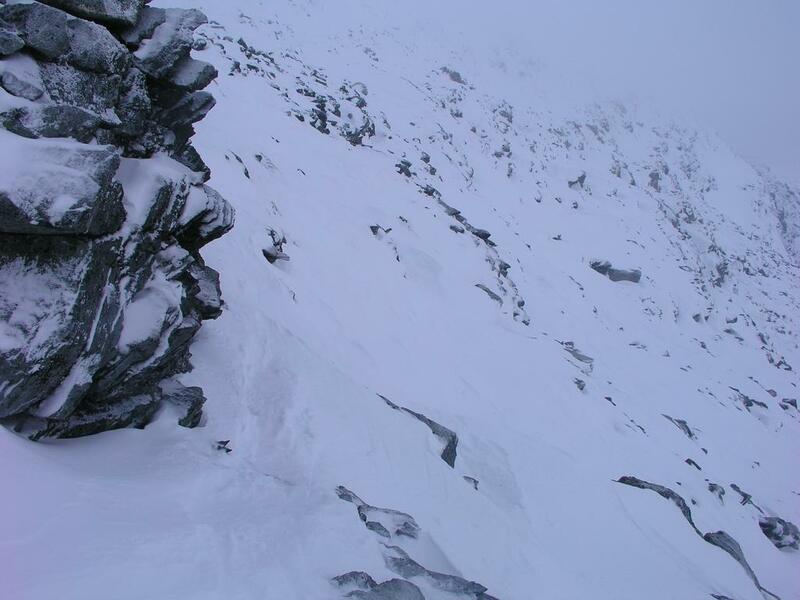 There are a couple of cuts into the main ridge that could be dangerous in bad weather. 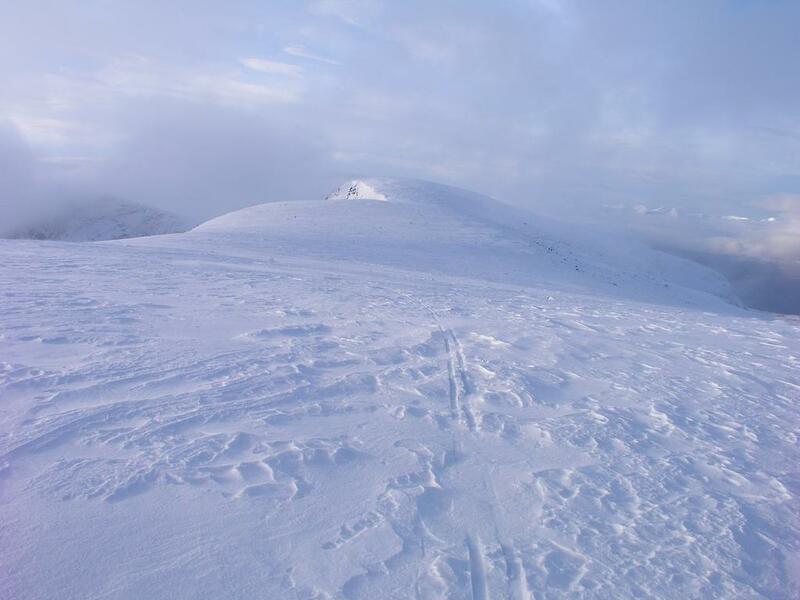 The summit is at the far north-east end of the ridge. 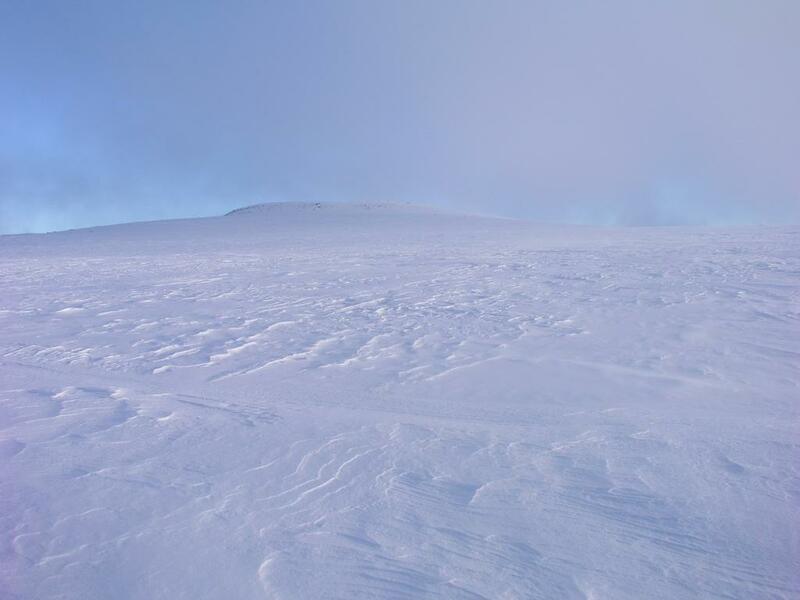 Interestingly, this summit can also be climbed from the north-east side, while the entire ridge is very steep on both sides, the mountain can be climbed from opposite ends. Comments: My first skiing for the season. A very nice winter climb, solo with nature. I drove from Bjorli while it was still dark and started the climb at 0735, pretty much as daylight came. I carried the skis to a point north-east of lake 1395, this took about one hour. The steeper part of the climb, from north-east of this lake and a bit passed the 1830 saddle between Børa (1916m) and Kleneggen took place with limited visibility due to clouds (fog). 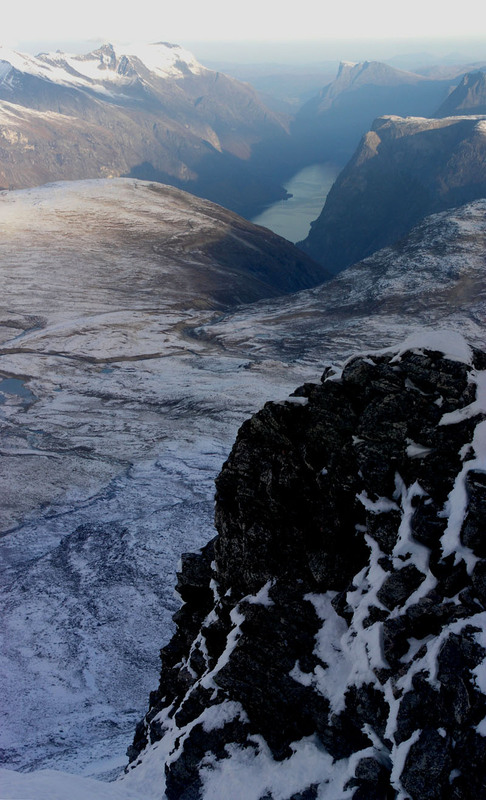 My traverse below Børa was deliberately a bit high in order not to miss the saddle. The steep cliffs dropping abruptly appeared in front of me, I was about 30 meter higher than the saddle. A careful decent along the ridge and I was in this rather distinct saddle, then upwards, still in the fog. In order to guarantee a safe descent I took a few extra GPS waypoints that would keep me away from the steeper areas. Fortunately, as I got up near point 1933, I exited the fog and had good visibility along the broad summit ridge. There are steep cliffs on both sides, I had decided to navigate very carefully along this section of the route. Instead, I could just enjoy good skiing and pretty good scenery to the west and north. I arrived at the summit cairn at 1005, looked around and took pictures. The most impressive scenery is north to the lake Eikedalsvatnet and the sharp peaks on its east side. My GPS showed an elevation of 1970 meter, a 6 meter high, which is a bit more than I normally expect. It was quite windy, snowdrift and variable light, not a place to make any substantial rest. Still, the visibility seemed much better than when I ascended, but the clouds could close in again on very short notice. The ski descent would certainly be a lot easier if I could see, so I left after only 10 minutes at 1015. The skiing back down went very nice, also on the somewhat steeper, rocky section. I was back at the car at 1200 sharp, the weather and the mountain had both been variable, new snow and rocks, fog and wind, snowdrift with sunrays, etc. Full winter at the higher elevations, barely snow near the car. Some running water, some frozen. The lake 1395 was not frozen. To have open water at 1400 meter this far north is most likely later than normal. The trailhead, the route heads up, then turns right up the small valley. The Kleneggen ridge, looking back. The Kleneggen ridge, looking ahead, the summit is near the horizon. View straight down to Inste Bruåbottvatna (1261m and 1254m). View down and north. Lake Eikesdalsvatnet is 1942 meter below. View south-east, towards Svarthøi 1883 meter. Panorama from south to west. The steepest section, careful routefinding produced a way that was ok to ski both up and back down.